In a world quickly moving toward agnosticism, atheism, open spirituality, or simple humanism, it can be a struggle for someone who appreciates their Christian heritage to find like-minded people. The challenge is only compounded when you’re a single looking for a significant other who shares these same traditions, values, and beliefs. But finding love that coincides with your religious beliefs doesn't have to be an uphill battle—and no, we're not suggesting you sign up for the church group’s book club that your mom has been begging you to join for years! There are millions of Christian singles out there looking for the same things that you are. Whether it’s someone who is devoutly religious, or a partner who respects and appreciates the traditions of your heritage but isn’t married to the practices, there’s someone out there for you. Here are 5 of the best online dating sites for Christian singles. The obvious top pick for Christian singles, Christian Mingle has millions of members. It’s not as astounding a number as many of the other dating sites, but that’s because you’re getting a much more condensed group of singles who are more appropriately matched to fit what you’re looking for. Christian Mingle is geared toward all Christians looking for friendship, companionship, and serious relationships. Its largest percentage of members fall into the 25-55 age range. Christian Mingle has a free trial that lets you create a basic profile, share photos, see other members’ profiles, search, and even use the discussion board. That’s a lot more than most sites will allow you to do on a freemium account. Christian Mingle uses several tests and quizzes to help you get the most out of the experience. For example, the ‘color-coded personality test’ helps define your interests, likes, and dislikes for more accurate search results. The ‘readiness IQ test’ will show you if you’re really ready to take the plunge and start a relationship. Zoosk is a tremendous dating site and app that has millions of members and more than 300,000 devout Christians. So, you’ll have plenty of options when looking for love matches that share your religious beliefs. If you are looking for matches that are accurate and on the mark, this could be the right site for you. Zoosk’s ‘behavioral matchmaking’ studies your behavior and constantly improves its suggested matches based on your likes and dislikes. You’ll love the detailed reports and insights Zoosk offers its members on each profile that is suggested. The signup process is simple and you can fill in more details about yourself later on. 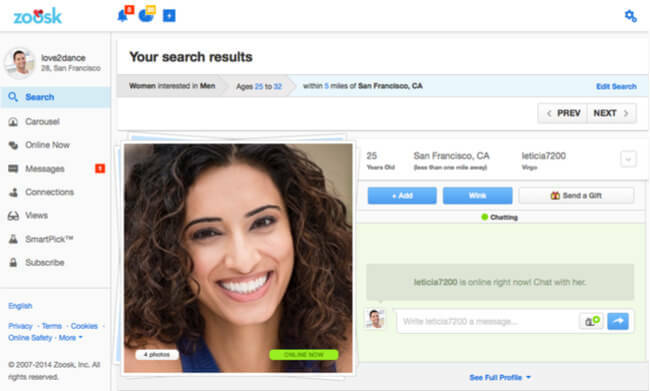 What’s more, Zoosk has a photo verification process. This means you have to take a selfie and send it into Zoosk before your profile gets approved. This isn’t just a smart safety precaution, weeding out the fakers who are just looking to rip you off, but it also helps ensure that the dating pool is cleaner. People who aren’t serious or are just looking to do something stupid are less likely to sign up when they know they’ll have facial accountability. So, you’re getting more serious matches with this process. The ‘Zoosk carousel’ might be the best part of this dating site. You will get a quick stream of profiles, and you can simply swipe yes, no, or maybe. This way you get to view multiple profiles every minute without having to spend the time manually searching for them. Match is a fish in the ocean scenario, and if you like the open water, you’re going to love this experience. Match has close to 100 million members, so there’s bound to be someone that’s perfect for you. While it may take a while to weed through the massive database, Match has some excellent tools to help you find the right person for you. For one thing, Match lets you search by keyword. So, you can type in "Christian," "religious," or "faith," and narrow down the options, weeding out the people who wouldn't even think to add those tags to their profile and are obviously not for you. Match also has the ‘daily five,’ an algorithm that combs the database every day to find you 5 of the most relevant matches based on your profile and preferences. It saves you doing all the legwork of sifting through profiles to find appropriate matches, and it is unusually accurate. Plus, Match members tend to be between the ages of 35-50. This age range is actually significant for Christians looking for love because the ever so slightly older generation is one that is more comfortable with their religious beliefs and hasn’t adopted the more non-denominational spiritual movement that is washing over the world in today’s younger generation. So, you're much more likely to find someone who is holding onto their Christian beliefs and traditions with this kind of clientele. Match has a great success rate too. Around 40% of their members find a long-lasting relationship in just a short time. And if you don’t? Match will give you another 6 months on the site for free. Eharmony, a dating site that was actually founded by a Christian psychologist, uses science and technology to make matches every day. Eharmony uses a personality test to measure levels of compatibility based on core values, beliefs, and preferences. So, Christians will be able to find matches that share their same core beliefs with ease. The site also features Christian dating articles on the advice blog. It’s filled with interesting tidbits like dating tips for finding a spiritually compatible partner, setting standards for Christian dating, and what to expect when seeking a soulful match. Eharmony also has other informative articles, including tips on safe online dating, picking the best first date spots, and how to tell when a profile is fake. These are good ideas for anyone to read up on. Finally, eharmony has both compatibility-based and location-based searches, so you can find Christians in your area that don’t just share your goals religiously, but have other common interests as well. 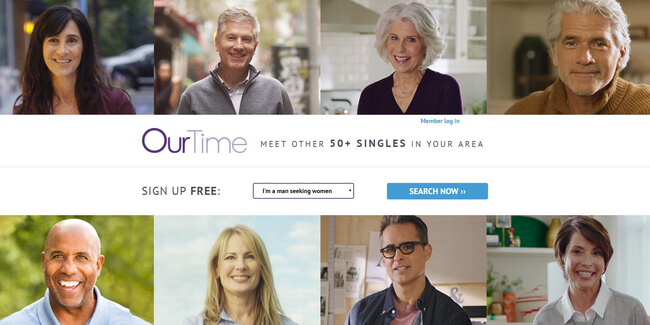 OurTime is a great choice for Christians over 50 who are looking for a more serious relationship. The site is specifically geared toward singles 50+. The older generation is more traditional, and so you're much more likely to find someone who is sensitive to Christian beliefs and practices with a more mature dating pool. Additionally, OurTime sends you 10 profile picks every day that were carefully selected based on your preferences. So, if religion is important to you, the system will choose other OurTime members who also value their Christian beliefs. OurTime has a ton of useful features that make the dating process not only easier, but safer and more fun for everyone. For example, the ‘ConnectMe’ feature lets you connect safely to other members. With this feature, you can text or even chat with a potential match without giving away your personal information—phone number, email address, etc. The ‘I’m Interested’ game keeps your screen filled with relevant matches based on your answers. And if getting the conversation started is something you dread, then the ‘Message Ideas’ feature will be the perfect ice-breakers. When you're ready to stop playing the field and find someone to share a serious long-term relationship with, you want to build that connection on similar value systems, shared beliefs, and supportive family traditions. That's why people who are looking for a real relationship turn to the more serious dating sites and apps. If you're a Christian looking for love and are tired of not finding it in all the usual places, then check out one of the sites above. You're sure to find a kindred spirit, the love of your life, and someone you can finally curl up with at night.